Human papillomavirus (HPV) infection has traditionally been regarded as a sexually transmitted disease (STD), but recent evidence implicates that an infected mother can transmit HPV to her newborn during pregnancy, at delivery, perinatal period or later. Given the lack of any studies on HPV-specific immune responses in children, we conducted HPV16-specific cell-mediated immune (CMI) monitoring of the mother-child pairs with known oral and genital HPV follow-up (FU) data since the delivery. In the Finnish Family HPV Study, 10 out of 331 mothers developed incident cervical intraepithelial neoplasia (CIN) during their 14-year FU. Our hypothesis according to the common dogma is that there is no HPV16 specific immune response in offspring of the CIN mother as she/he has not started the sexual life yet. We used overlapping 30–35 mer peptides covering the entire HPV16 E2, E6 and E7 protein sequences. Assays for lymphocyte proliferation capacity, cytokine production and HPV16-specific Foxp3 + CD25 + CD4+ regulatory T-cells were performed. HPV16-specific proliferative T-cell responses were broader in children than in their mothers. Nine of 10 children had responses against both E2 peptide pools compared to only 4 of the 10 mothers. Six of the 10 children and only 2 mothers displayed reactivity to E6 and/or E7. The cytokine levels of IL-2 (p = 0.023) and IL-5 (p = 0.028) induced by all peptide pools, were also higher among children than their mothers. The children of the mothers with incident CIN3 had significantly higher IFN-γ (p = 0.032) and TNF-α (p = 0.008) levels than other children. Our study is the first to show that also children could have HPV-specific immunity. These data indicate that the children have circulating HPV16-specific memory T-cells which might have been induced by previous HPV16 exposure or ongoing HPV 16 infection. Persistent high-risk (HR) human papillomavirus (HPV) infection is the most important risk factor for cervical cancer (CC). Of the HR-HPV genotypes, HPV16 is the most prevalent, present in 50% of all CC cases worldwide [1, 2]. It has been estimated that over 80% of women will encounter genital HPV infection during their life-time  but only a minority of these infections will ever progress to malignancy [4, 5]. Based on recent meta-analysis, around 291 million women worldwide are carriers of HPV DNA, of whom 32% are infected with HPV16 or HPV18, or both . HPV-induced immunity is crucial for clearance of the infection. However, HPV is known to have several mechanisms to evade the host immune system, as recently discussed [7–12]. HPV replication is linked with the differentiation of keratinocytes in a way that inhibits virus detection by the host. In productive HPV infections, viral particles are released from the dying keratinocytes on the epithelial surface. Thus, there is neither cytolysis inducing inflammation nor pro-inflammatory cytokines activating macrophages or Langerhans cells (LC) in infected epithelia . According to current concepts, there is no blood-borne stage in the life cycle of HPV and the viral early (E) proteins are expressed only at low levels in the nucleus of an infected cell. Oncoproteins E5, E6 and E7 of the HR-HPV can modulate antigen presentation by impairing the assembly of peptide-MHC complexes, and block the anti-viral responses at the stage of cell entry and virus presentation, by modifying the production and functions of cytokines such as interferons . Until now, most research on HPV immunity has been focused on cervical HPV infections in women. HPV immunity is based on circulating HPV-specific CD4+ T helper (Th) and CD8+ cytotoxic T lymphocytes (CTLs) of the adaptive, cell mediated immune (CMI) system . These cells can be targeted to the E and late (L) HPV proteins and migrate to the site where the viral proteins are presented . In healthy subjects, circulating CD4+ and CD8+ T cells specific for HPV16 E antigens are frequently detected [13, 14], while HPV-induced cervical intraepithelial neoplasia (CIN) or CC are characterized by weak HPV E antigen-specific T-cell immunity, and these merely CD4+ T cells have an impaired capacity to produce Th type 1 (Th1) and type 2 (Th2) cytokines [7, 12, 13, 15–17]. In contrast to effector cells, regulatory T cells (Tregs) are known to suppress virus-specific immunity . HPV16-specific Foxp3+ CD4+ regulatory T-cells have been associated with immunosuppressive responses as they are capable of inhibiting the proliferation of naïve CD4+ T-cells and Th1-cells and their cytokine production [17, 19, 20]. HPV infection has been traditionally considered as a sexually transmitted disease (STD). However, recent meta-analysis confirmed that newborns of the mothers with genital HPV infection had 33% higher risk to acquire HPV infection than those of HPV-negative mothers [21, 22]. Vertical transmission from an infected mother to her newborn can occur during pregnancy via infected placenta, cord blood, ascending cervical infection or through an infected birth canal at delivery [23, 24]. Horizontal HPV transmission might occur for instance via breast-feeding, from sibling via kissing or friends via digital contacts [22, 25]. Persistent oral HPV in newborn has been well documented but with highly variable frequencies from 1% up to 83% [26–29]. We have recently shown that 18% of the oral samples of the newborns and 16% of the cervical samples of mothers tested HPV DNA-positive. The HPV genotype profile of the mother-newborn pairs was almost identical at delivery but lost this similarity during the first 2 months . The Finnish Family HPV study was designed in 1998 to elucidate the dynamics of HPV transmission between the family members [30, 31]. In the present study, we analyzed the HPV16-specific CMI responses among the women who developed an incident CIN. HPV16-specific immunity was related to their known oral and genital HPV DNA status and HPV serology during the FU. Of special interest was to assess whether or not their children have developed HPV16-specific CMI reactivity at the same time point. Notable is that none of these children has been HPV vaccinated or started his/her sexual debut. The Finnish HPV Family Study is a longitudinal cohort study conducted at the Department of Oral Pathology, Institute of Dentistry, University of Turku and Department of Obstetrics and Gynecology, Turku University Central Hospital. The study plan was approved by the Research Ethics Committee of Turku University Hospital (#3/1998 and 45/180/2010). Originally, 329 pregnant women at their 3rd trimester pregnancy and all their newborns (n = 331; included two twins) were enrolled in the study between 1998 and 2001, as described previously [29–31]. During the FU until present, 12 women developed an incident CIN, as recently reported . These women and their children were recalled for blood sampling. Written informed consent was obtained from 10 of these women, with mean age of 37.0 years and 12.2 years of their children, respectively. Three of the children were girls and seven were boys. None of these children had had any sexual contacts or received prophylactic HPV vaccination before or during study onset (Characteristics of the mothers and their children are summarized in Additional file 1: Table S1). As a negative control group three healthy women who remained HPV negative during FU were included with their children (in total two girls and one boy). The mothers and their children were at the same age as those in the study group. HPV detection methods as well as the antibody screening against the major capsid protein L1 of HPV 16 have been detailed in previous reports [22, 24, 32, 33]. The authors acknowledge the concept of the Minimal Information About T cell Assays (MIATA) framework, which was recently published [34, 35]. Therefore, detailed information is provided as structured in the proposed 5 modules by MIATA: the sample, the assay, the data acquisition, the data analysis and the laboratory environment in which the human T-cell assays were performed. Venous blood samples were collected from mothers (74 mL) and children (54 mL) in sodium-heparin collection tubes and peripheral blood mononuclear cells (PBMCs) were isolated within three hours by centrifugation over Ficoll-Hypaque gradient (GE Healthcare Life Sciences, Uppsala, Sweden) and washed with PBS. Viable and dead cells were counted using trypan blue staining. For determining the proliferative capacity of HPV16–specific T cells by short–term lymphocyte stimulation test (LST), ~10×106 PBMCs were used and the remaining cells were frozen in 80% Fetal Bovine Serum (FBS, Biowest, EU quality) and 20% DMSO (Merck, Darmstadt, Germany) (10 million PBMCs per mL per vial) using Nalgene™ Cryo 1°C Freezing container, which ensures a −1°C/min rate of cooling, at −70°C, and after 1–2 days stored the cryopreserved PBMCs in liquid nitrogen until further use. The median time from sample collection until beginning of LST or cryopreservation was 3 hours. From 9 mL of blood collected into clotting tube the serum was isolated by centrifugation for 7 minutes at 1000 g. Obtained autologous serum was used for short-term T-cell proliferation assay as described previously [36, 37]. Panels of overlapping 30–35 mer peptides with HPV16 E2, E6, and E7 protein sequences were synthesized by solid phase peptide synthesis (SPPS) method with >95% purity (ChinaPeptides Co. Shanghai, China), with a 14 (for 30-mer) or 15 (for 35-mer) amino acid (aa) overlap. Two pools of E2 peptides (E2.1 and E2.2) consisted of 12 or 11 (30-mer) peptides, respectively. Four pools of E6 and two pools of E7 peptides (E6.1-E6.4 and E7.1 and E7.2) consisted of two 32-mer or 35-mer peptides, respectively. The peptides are detailed in Table 1. Peptide quality was tested by mass spectrum and high-performance liquid chromatography (HPLC). Lyophilized peptides were dissolved in distilled water or in water with 10% DMSO for proper dissolution. Peptides were stored at −20°C with the final concentration of 1 mg/mL. Eight peptide pools were used to determine the proliferative capacity of HPV16-specific T-cells, for cytokine production analysis and detection of the HPV16-specific Foxp3+ regulatory T-cells. Memory response mix (MRM) stock solution (50×), consisting of tetanus toxoid, 0.75 fL/mL (Statens Serum Institut, Copenhagen, Denmark), Tuberculin PPD, 5 μg/mL (Statens Serum Institut), and Candida albicans, 0.015% (Greer Laboratories, Lenoir, USA) was used as a positive control for the proliferation assays and cytokine production capacity of the PBMCs . The original protein sequences were derived from NCBI Protein database: http://www.ncbi.nlm.nih.gov/protein. Accession numbers: AAA46941.1 (HPV16 E2), 4927720 (HPV16 E6), and 739162 (HPV16 E7). The freshly isolated PBMCs with a density of 1.5 × 105 cells per well were seeded into U-bottomed 96-wells microtiter plate (Nunc, Roskilde, Denmark). Eight replicative wells were used for each peptide pool. The PBMCs were cultured in IMDM (Gibco, Life Technologies, Belgium) containing 10% autologous serum and the indicated peptide pool at a final concentration of 5 μg/mL per peptide. PBMCs cultured with MRM were used as a positive control (10 μl/well of 4xMRM) and with no antigen (medium-only) as a background control. After 6 days of culturing the supernatants of all eight replicative wells were collected and pooled for cytokine analysis. A compensatory amount of IMDM supplied with 0.5 μCi [3H]-Thymidine (PerkinElmer, Turku, Finland) per well was added. After 18 hours of incubation, the cells were harvested into Unifilter plates (PerkinElmer) using the FilterMateTM Cell Harvester (PerkinElmer). Subsequently, the filter plates were dried and counted on the 1450 MicroBeta + counter (PerkinElmer). The cut-off value for counts per minute (CPM) values was determined by the average plus 3 × SD of the eight medium-only control wells. Stimulation index (SI) was calculated as the average of tested eight wells divided by the average of the medium-only control wells. The proliferative response was defined positive if the CPM values of at least six of the eight wells were above the cut-off value and if the SI was ≥3 [13, 14]. The supernatants collected from LST at day 6 were analyzed using Cytometric Bead Array (CBA) human enhanced sensitivity flex set system (BD Biosciences, Temse, Belgium) according to the manufacturer’s instructions. In this array, the levels of IFN-γ, TNF-α, IL-2, IL-5, IL-10, and IL-17A were determined. The detection limits for the cytokines were based on standard curves complying with the limit of 274 fg/mL described by the manufacturer. The positive antigen-induced cytokine production was defined as a cytokine concentration > 2× the concentration of the medium-only control . Cytokines were not analyzed in the children of the negative control group. Frozen PBMCs were thawed and seeded into 24-wells plate (1.0 × 106 cells/well). The cells were cultured in IMDM containing 10% Human AB serum (Sigma-Aldrich, San Louis, USA) and the indicated peptide pools (Table 1) at a final concentration of 5 μg/mL per peptide. PBMCs cultured with MRM were used as a positive control (80 μl/well of 4xMRM) and without antigen (medium-only) were used as a background control. After 7 days of culturing, the cells were harvested, washed with 0.5% BSA in PBS and stained first with surface markers CD25 (1:25) (Anti-CD25 FITC, clone M-A251, BD Pharmingen, San Diego, CA), CD4 (1:100) (Anti-CD4-APC, clone RPA-T4, BD Pharmingen), CD8 (1:30) (Anti-CD8 PerCP-Cy5.5; clone SK1, BD Pharmingen). Subsequently, the cells were fixed and permeabilized using intra-nuclear staining buffer set (FOXP3 Fix/Perm buffer set, Biolegend, San Diego, CA) according to manufacturer’s instructions. Before intracellular staining with Foxp3 (PE anti-human FOXP3, Biolegend) or isotype control (PE Mouse IgG1, κ Isotype Ctrl, Biolegend), blocking was done with 2% FCS. All staining procedures were done on ice. After staining, the cells were washed, resuspended in PBS and measured by the flow cytometer BD FACSCalibur (BD Bioscience). Analysis was performed by using Flowing Software, version 2.5.0 (Cell Imaging Core, Turku Centre for Biotechnology, Turku, Finland). The fluorescent intensity of MRM-stimulated and medium-only control cells was used to set the gates for the other samples. An antigen-induced alteration in the population percentage was defined as a change of at least 2× the corresponding percentage in the medium-only control [36, 38]. HPV16 –specific CD4 + CD25 + Foxp3+ regulatory T cells were not determined in the children of the HPV negative control group. All statistical analyses were run using IBM SPSS® (IBM, Inc., New York, USA) software package (IBM SPSS Statistics for Windows, version 20.0.0.1). Frequency tables were analysed using the χ2-test, with the likelihood ratio or Fisher’s exact test for categorical variables. Differences in the means of continuous variables were analysed using non-parametric (Mann-Whitney or Kruskal-Wallis) tests for two- and multiple independent samples, respectively. Paired-samples test (Wilcoxon) was used to analyse the response levels in mother-child pairs. All statistical tests were two-sided and declared significant at p-value ≤0.05. The laboratory of the Oral Pathology at the Institute of Dentistry, Faculty of Medicine, University of Turku, Turku, Finland, is a research laboratory where the T-cell assays are performed according to SOPs, including the predefined criteria for positive responses. All the methods needed for the CMI studies were transferred from the laboratory of van der Burg under his and Dr. Welter’s close guidance and quality control. Additional file 1: Table S1 summarizes the medical history of the mothers’ cervical lesions, oral and genital HPV status and HPV-specific serology, as well as the oral HPV DNA status and HPV serology of their children, followed since birth until present. Among the women with incident CIN, five women had CIN3, three had CIN2 and two developed CIN1. Long-term persistence of HPV16 preceded all incident CIN2 and CIN3 lesions. Five women (IDs 1A, 2A, 3A, 6A, and 8A) tested also occasionally HPV16-positive in their oral mucosal samples (data not shown), and seven women (IDs 1A, 2A, 3A, 4A, 6A, 7A and 10A) had HPV16 antibodies detectable in sera at different time points. Six children (IDs 2B, 3B, 5B, 6B, 8B, 10B) tested also occasionally HPV positive in their oral samples, of whom two children were HPV16 positive (IDs 8B and 10B). 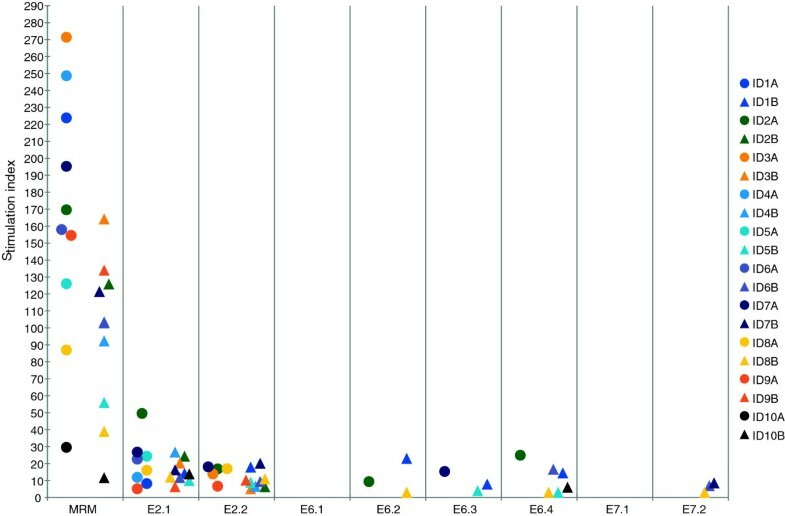 PBMCs of all ten mothers and children showed proliferative response against MRM (Figure 1). The MRM responses in mothers were stronger than in children, although the range of SI was wide both in mothers (30–271) and their children (12–164). HPV16-specific proliferative T-cell response was found in 9 out of 10 mothers and in all the ten children at least to one of the peptide pools of E2, E6 and E7 (Figure 1). Nine mothers had reactivity to the peptide pool E2.1 (aa 1–195) and four of them had reactivity also to the pool E2.2 (aa 181–365). Only two mothers had response to E6 peptides; one to peptide pools E6.2 and E6.4 (ID2A) and the other to peptide pool E6.3 (ID7A). No HPV16 E7-specific response was found in any of the mothers. Proliferative T-cell responses. Proliferative T-cell responses against peptide pools of HPV16 E2, E6 and E7 of the ten mothers and their children. (●) represents stimulation indexes of the mothers and (∆) stimulation indexes of their children. The mother and her child are labelled by the same color. Only responses considered positive are shown. MRM = memory response mix. One of the mothers had no response to any of the peptide pools (ID10A). She had a persistent HPV16 infection detectable for at least 72 months and eventually developed a CIN1 lesion with an HPV16/66 double infection. She had HPV16 antibodies detectable only once; one year after study entry, despite persisting HPV16. In addition, she showed the lowest proliferative T-cell response to the common recall antigens in the MRM (Figure 2A) which might indicate an impaired overall CMI response. All but one (ID7A) of the mothers who developed CIN2 or CIN3 displayed HPV16-specific proliferative T-cell responses to E2.1 but did not respond to E6 and/or E7. This particular mother (ID7A) responded to E6.3 (Figure 2A), confirming our previous data that women with HSIL do not properly respond to the oncoproteins E6 and E7 [17, 39]. 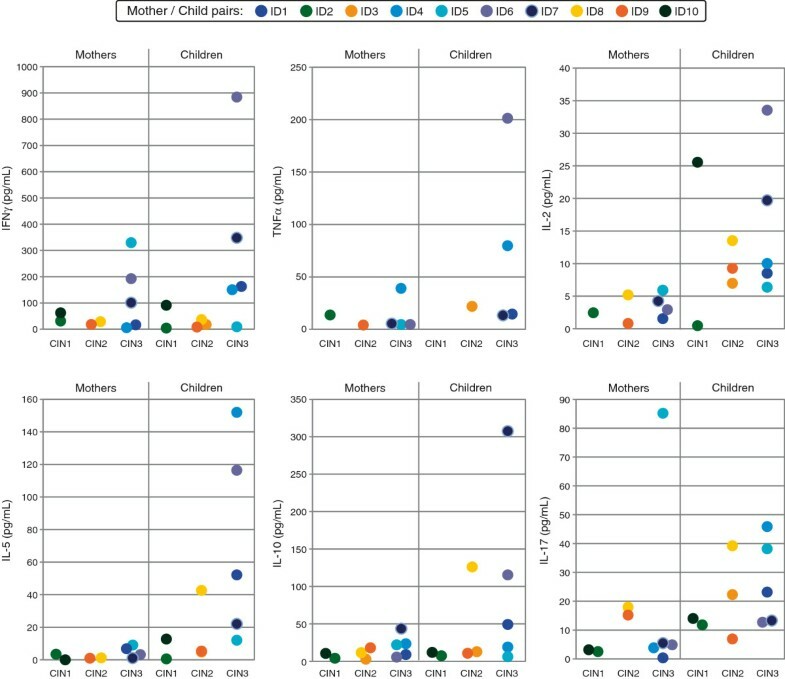 Results of LST, cytokine and Foxp3 assays among CIN1, CIN2 and CIN3 mothers and their children. A) HPV16 specific lymphocyte stimulation test (LST) results. The mothers and their children are grouped according to the mothers CIN. 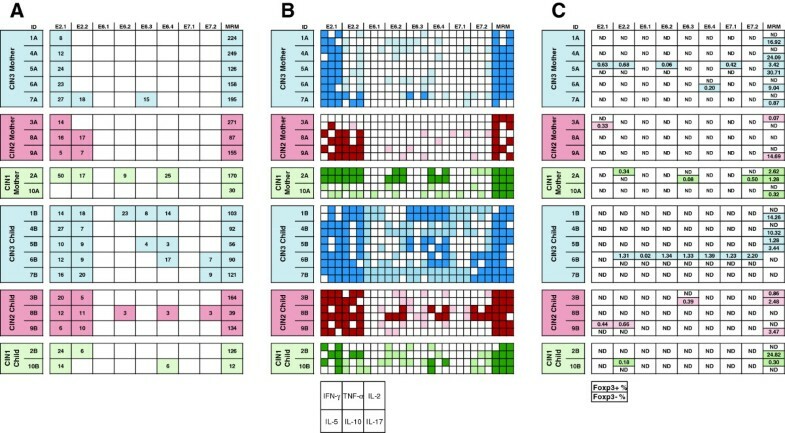 Only positive responses are marked with colored box and stimulation indexes are given in the boxes under the corresponding peptide pools. The blue color is used for the mothers with CIN3 and their children, the red color for the mothers with CIN2 and their children and the green color represent mothers with CIN1 and their children (the same color codes are used also in Figure 2B and 2C). Memory response mix (MRM) was used as a positive control for LST assay. B) Cytokine assay results. Supernatants from the LST were analyzed for the presence of cytokines IFN-γ, TNF-α, IL-2, IL-5, IL-10, and IL-17. One square in a box with 6 squares represents the production of the cytokine type as given in the index box lowest in the figure. Cytokines found in those supernatants from wells with positive proliferative responses are marked with dark colors. Lighter colors are used when the corresponding LST result was negative. C) Foxp3 assay results. The box, when marked is divided into two parts. The upper value presents the percentages of (CD4 + CD25+) Foxp3–positive cells while the lower value presents the (CD4 + CD25+) Foxp3-negative cells after subtraction of the medium-only control value. Only positive (upregulation) responses are shown. Upregulation of Foxp3+/− cells is defined as at least twice the percentages of those in the medium-only control. Foxp3 = forkhead box P3, ND = not detectable. All children had HPV16-specific proliferative T-cell response against the peptide pool E2.1, and 9/10 also responded to the pool E2.2 (Figure 2A). An E6-specific response to peptide pool E6.4 spanning the last aa (109–158) was detected in five children, of whom two had response also against the pool E6.2 (IDs 1B and 8B) and two against pool E6.3 (IDs 1B and 5B). E7-specific response to pool E7.2 spanning the second half of the E7 protein (aa 43–98) was detected in three out of ten children (IDs 6B, 7B and 8B). All children of mothers who developed incident CIN3 had an HPV16 E2-specific T-cell response, four of whom also responded to E6 and/or E7. One child (ID8B) of HPV16+ CIN2 mother responded to multiple peptide pools of HPV16. Also one child (ID10B) of the HPV16+ CIN1 mother has response to E6.4 peptide pool. Interestingly, both these children were the ones who harbored HPV16 infection in their oral mucosa at baseline. Three healthy and HPV negative mothers also showed positive LST responses to all peptide pools except for E6.1 and E7.1 pools. 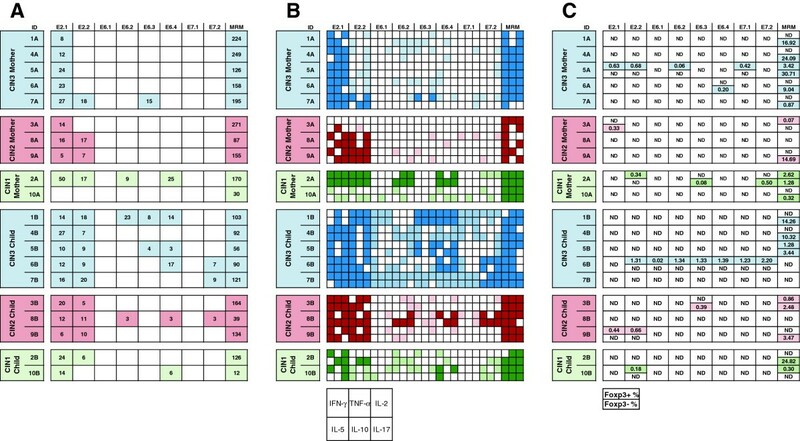 Control group of mothers showed responses to peptide pools E2.1 (mean of the SI 25,65, range 22,07-28,57), E2.2 (mean of the SI 14,47, range 4,13-22,72), E6.2 (mean of the SI 4,07, range 0–4,07), E6.3 (mean of the SI 10,68, range 0–10,68), E6.4 (mean of the SI 13,98, range 4,74-23,21), E7.2 (mean of the SI 7,19, range 0–7,19) and MRM (mean of the SI 37,13, range 22,07-48,35). The control group of mothers showed slightly more E6 and E7 responses than the study group and the control group of children showed fewer responses to peptide pools E6 and E7 than the study group (data not shown). One mother showed positive LST responses only for E2.2 peptide pool when two others showed positive responses for both E2.1 and E2.2 peptide pools. In addition to responses for peptide pools of E2, the one mother showed responses also for peptide pools E6.2 and E6.4 and the other mother showed responses also for E6.3, E6.4 and E7.2 peptide pools. Control group of children showed responses only for peptide pools E2.1 (mean of the SI 11,56, range 3,45-21,98), E2.2 (mean of the SI 7,20, range 4,24-11,62), E6.4 (mean of the SI 4,48, range 0–4,48) and MRM (mean of the SI 81,47, range 9,74-171,63). All responded for peptide pools E2.1 and E2.2 and only one child also for peptide pool E6.4 (data not shown). Figures 2B and 3 summarize the results of cytokines produced by the PBMC in the LST of both the mothers and their children, stratified by the mother’s degree of CIN. Overall, IFN-γ, IL-17A and IL-2 were the most predominant cytokines followed by IL-10, IL-5 and TNF-α in mothers, whereas all cytokines were found among the children. IL-4 was rarely detected and therefore not shown. HPV16–specific, Th1 cytokine (IFN-γ and TNF-α) responses accompanying the proliferative T-cell responses were found in 6/10 mothers and in 5/10 children. This was frequently (in 5/6 mothers and in all children) accompanied by Th2 (IL-5 producing) T-cells. Mother ID3A was the only mother who had no IFN-γ or IL-5 response for any of the peptide pools and showed a proliferative T-cell response only against the pool E2.1 (Figures 2B and 3). She developed an incident CIN2, HPV16 DNA being detectable in her cervical and oral samples twice and four times, respectively. In addition to HPV16, also HPV genotypes 6, 31, 70, 82 (in cervical smear) and 66 (in oral sample) were detected. She also tested constantly HPV6 seropositive. Cytokines accompanying the proliferative response of T cells in the LST. The cumulative amounts of the individual cytokine for all peptide pools as determined by CBA are depicted. The mothers and their children are grouped according to the mothers CIN. Only cytokine levels above detection limits are shown. The children of mothers having developed CIN3, showed significantly higher IFN-γ (p = 0.032) and TNF-α (p = 0.008) levels than the other children. The cytokine levels of IL-2 (p = 0.023) and IL-5 (p = 0.028) induced by all peptide pools, were higher among the children than their mothers. In the pair-wise comparison of the mother-child-pairs, the levels of IL-2 and IL-5 showed statistically significant difference between the mother and child (p = 0.013 and p = 0.009, respectively). Control group of mothers showed highest cumulative amounts cytokine levels for IFN-γ (mean 139,03, range 12,99-210,13), IL-17 (mean 60,00, range 3,39-101,04) and IL-10 (mean 40,29, range 7,30-83,24) followed by IL-2 (mean 14,54, range 6,93-29,67), IL-5 (mean 13,65, range 1,65-29,13) and TNF-α (mean 2,88, range 0–6,41) (data not shown). HPV16 E2-specific IFN-γ producing T-cells to both E2.1 and E2.2 peptides were detected in 7 mothers (Figure 2B). HPV16 E7.1 peptide specific IFN-γ producing T-cells were found in only one of the mothers (ID8A), while E6.2, E6.3 and E6.4 responses were found in three (IDs 6A, 9A, 10A), four (IDs 4A, 6A, 7A and 9A) and four (IDs 2A, 6A, 7A and 10A) mothers, respectively (Figure 2B). Six children had IFN-γ producing Th1 cells against at least one of the peptide pools of HPV16 E2, E6 and E7. The mother of the child ID6B, who had the highest levels of IFN-γ, TNF-α and IL-2, had cervical disease during the entire FU, in which the disease varied from non-squamous intraepithelial lesion (NSIL) to CIN3 with five different HPV genotypes identified. In 8 out of 10 mothers, T-cells had the capacity to produce IL-2 against E2 protein and 6 of the 10 mothers displayed an IL-2 response to E6. E7.2-induced IL-2 production by T-cells was detected in all three women. HPV16-specific IL-2 responses were more frequently found in children than in their mothers. The concentrations of IL-2 were low, remaining mostly under 24.0 pg/mL except in two children (IDs 6B and 10B). HPV16 induced antigen-specific TNF-α secretion was detected in six mothers and in five children (Figure 2B). IL-10 and IL-17A were detected in all mothers and children at least as a response to one of the HPV16 E2, E6 or E7 peptides. They were usually detected in parallel, the levels of IL-10 (up to 81.97 pg/mL) being usually higher than those of IL-17A (up to 75.26 pg/mL) for the individual peptide pools (Figure 3). The mother ID5A with the highest IL-17A levels developed CIN3 and tested HPV16 DNA-positive five times without any HPV seropositive response during the FU. Her child had a wider HPV16-specific T-cell proliferative response with positive reaction to four different peptide pools (E2.1, E2.2, E6.3 and E6.4). Interestingly, the highest level of IL-10 was detected in child ID7B, whose mother (ID7A) showed almost an identical history of cervical disease (repeatedly HPV16 DNA-positive and CIN3), similar as mother ID5A described above. However, ID7A was HPV16-seropositive and had also a broader proliferative response against HPV16 than most of other mothers in our study. Among control group of mothers, the highest cytokine levels were with IFN-γ, IL-17 and IL-10 followed by IL-2, IL-5 and TNF-α. The levels of all cytokines are presented in the legend of the Figure 3. In the control group, the secretion of TNF-α is the most minor comparing to the other cytokines measured (data not shown). In study group, the TNF-α have the fourth highest secreted levels measured, instead. To summarize, PBMC cultures displaying HPV16-specific proliferative responses produced slightly higher levels of inflammatory cytokines than PBMC cultures not responding by proliferation. Especially Th1 –, Th2 –, and Th17-type cytokines were identified in response to HPV16 peptides (Figure 2B). When comparing the mothers and children as groups the cytokine levels of IL-2 (p = 0.023), and IL-5 (p = 0.028), were higher in children than their mothers for all peptide pools, irrespective of the proliferative status, indicating that they have a more polarized HPV16-specific Th1 and Th2 response. The children of mothers having developed CIN3, showed significantly higher IFN-γ (p = 0.032) and TNF-α (p = 0.008) levels than the other children. In both those cytokine groups mentioned was one outliner, the child with ID6 (Figure 3). In the pair-wise comparison of mother-child-pairs, the levels of IL-2 and IL-5 showed statistically significant difference between the mother and child (p = 0.013 and p = 0.009, respectively). The frequency of CD4 + CD25 + Foxp3+ cells after 7-day stimulation was analyzed (Figure 2C). Two mothers had positive responses at least to some peptide pools. Mother ID2A showed positivity to peptide pool E2.2, while ID5A showed responses to peptide pools E2.1, E2.2, E6.2, and E7.1. Also in three children, Foxp3+ subsets were expanded: ID6B responded to all pools except pool E2.1; ID9B responded to pools E2.1 and E2.2, and ID10B pool E2.2. Figure 2C represents the percentages of CD4 + CD25 + Foxp3+ regulatory T-cells and CD4 + CD25 + Foxp3 (negative) T-cells for all peptide pools. More Foxp3+ responses were measured among control group of mothers than study group of mothers but the levels were lower. One mother showed no Foxp3+ responses at all, but two other mothers showed responses at least to five different peptide pools including all three peptides (E2, E6 and E7). One mother showed Foxp3+ responses to all HPV peptide pools (data not shown). In the present study, we examined the HPV16-specific T-cell responses in 10 children born to mothers, who had developed an incident CIN. According to the common dogma no HPV16 specific immune response should be found as the offspring of the CIN mothers had not started their sexual life yet. PBMCs derived from these mother-child pairs were stimulated with HPV16 E2, E6, and E7 peptides to estimate the lymphocyte proliferation response and their cytokine secretion. Our results showed that i) all these children harbored a T-cell response against HPV16 peptides, ii) the responses of the children were broader than those of their mothers (p = 0.0146). In the present study, the children mounted concomitant T-cell responses to HPV16 E2, E6 and/or E7. Previously we reported that there are highly conserved domains in HPV E2 protein sequence among different HPV genotypes, which could lead to cross-reactivity between the E2 peptides of different types of HPV [13, 14]. However, cross-reactive T cells to HPV16 E6 are rare  suggesting that the responses observed in these children most likely reflect true circulating HPV16-specific memory T-cells during their early childhood. The authors consider that rather perplexing, because all these children were sexually inexperienced. These results indicate that these children must have had an exposure to HPV16 infection at some body sites. Given that the majority (6/10) of them had detectable HPV DNA in their oral samples, oral mucosa seems to be a plausible route of HPV acquisition and for the stimulation of HPV16-specific adaptive immune responses. These results reinforce the concept that part of HPV infections are acquired already at childhood by non-sexual routes of transmission [21, 22] and suggest that HPV-immunity could be evoked early at life. Even in the control group of the HPV-negative mothers an HPV 16 specific immune response was found supporting the view that nearly all women will be infected with HPV. The important question is the age when one will get the first exposure to HPV and how. The individual differences between immune responses of HPV-infected persons will determine either the virus infection will persist or will be resolve such as our results of control groups showed. More studies are needed to discover the crucial differences in the immune systems concerning HPV infections. Interestingly, rarely an HPV16 E6-specific and no HPV16 E7-specific proliferative T-cell responses were found in the mothers, despite the facts that all had developed an incident CIN as a consequence of a persistent genital HPV16 infection and that the HPV16 E6 and E7 proteins should be expressed in all HPV16–induced CIN3 and CC lesions . Five children displayed T-cell reactivity to E2 and E6, two of whom also reacted to E7. One other child reacted to HPV16 E2 and E7. The children’s response pattern fits with previous data showing that whereas E2- and E6-specific responses are readily found in healthy individuals, this is not the case for E7 [13, 37]. The absence of responses in their mothers also is in line with previous data showing lack of responsiveness in patients with CIN and CC . The children’s oral sample tested HPV16-positive in two cases, one was HPV18 positive and one HPV6 positive while two were HPV DNA-negative. Thus, there was no straightforward correlation between the detection of HPV in the children and their HPV-specific immune response, except for the fact that five of the mothers of these six children tested HPV16 and one HPV18 DNA-positive in their cervical samples, and four were seropositive for HPV16 or multiple types. T helper type 1 cytokine IFN-γ and T helper type 2 cytokine IL-5 production is the characteristic for HPV16-specific immune response among healthy subjects but this is lost in patients with CC . In the present study, the cytokine levels of IL-2, IL-5, IL-10, and IL-17A were higher in children than their mothers indicating that they have a more polarized HPV16-specific Th1 and Th2 response and this would be in line with their disease status. Interestingly, mother’s high-grade CIN3 resulted in the strongest and broadest HPV16-specific CMI response in their children. A worth noticing is that there was one outliner among samples from children of mothers with CIN3, which raised the total level of IFN-γ and TNF-α of those children. Nevertheless, the produced IFN-γ and TNF-α levels were still highest among children of mothers with CIN3 than other children. The one child which has the highest IFN-γ and TNF-α levels, had also highest IL2 and IL-10 levels, so it might be that this child has fairly high HPV-specific immune responses in its entirety. Many studies have described HPV16–specific CMI reactivity among women with HPV-induced CC or CIN [36–38]. In the present study, all these women had developed incident CIN which was adequately treated, and who consequently could be considered to have passed their HPV-induced disease. However, they cannot be regarded as healthy because of their long-lasting HPV history and increased risk for recurrent disease. In a previous study, increased CD4 + CD25+ Foxp3+ frequency was found in women who developed CIN3 . Thus, increased frequencies of this cell types might predispose to increased risk for high-grade CIN and CC. In the present cohort, two mothers were positive for CD4 + CD25+ Foxp3+ cells, both of them having a persistent HPV16 infection (a known risk factor for recurrent disease). In contrast to all mothers, the children in this study should be considered as healthy and sexually inexperienced subjects. However, three children were already CD4 + CD25 + Foxp3-positive which might indicate that they are at risk for HPV-associated diseases in the future. To conclude, our data support the view that HPV infection can be transmitted by non-sexual routes. The overall higher HPV16-specific responses of the children who have not started their sexual life than that of their mothers with CIN suggest that an early transmission may also lead to protective immunity. The exact mechanism remains yet unknown and further studies are urgently needed. Hanna-Mari Koskimaa, Anna E Paaso contributed equally to this work. We express our warm thanks to all the participants in the Finnish Family HPV study. Special thanks also go to Dr. Marjut Rintala and Dr. Karolina Louvanto for their skillful execution of the 7th FU visit of this cohort. In addition, we are grateful to Dr. Jaana Willberg and Dr. Lilli Wideman for collecting the oral samples. Also the technicians Nikki Loof and Linda Stynenbosch (Leiden University Medical Center, Leiden, the Netherlands) are acknowledged for technical training of Hanna-Mari Koskimaa and Anna Paaso to make and transfer the immune monitoring assays. This study has been supported by the Academy of Finland (16438/2006, #130204/2008), Finnish Cancer Foundation, Sohlberg Foundation, Finnish Dental Society, and the Government Special Foundation (EVO) to Turku University Hospital. The funders had no role in the study design and data analysis, decision to publish, or preparation of the manuscript. HMK and AEP performed the research, provided essential reagents and tools. SMS and SEG designed the cohort and the current study. HMK, AEP, SMS, MJPW, SHVDB, and KJS analyzed data and HMK, AEP, SHVDB, MJPW, SMS and KJS contributed in writing the manuscript. All authors read and approved the final manuscript.